We will tell you right from the start: To Beat! Big things are being prepared in our beloved home sweet Bushwick. There will be so much art, you might easily overdose on it. And nobody, and I mean nobody, will escape! While in the city thousands of art lovers will head over to the art fairs of Armory Week, Brooklyn is not falling behind. During Brooklyn Armory Night on Saturday almost every gallery in the borough will stay open late. In Bushwick, 15 galleries and art spaces will be participating in the biannual late night gallery walk, Beat Nite! This is the 7th Beat Nite in the history of Bushwick, and as 7 is a lucky number, this week’s Beat Nite is bound to be absolutely rad. We advise you to take friends, and maybe ride a bike, because you don’t want to miss awesome art spaces in Ridgwood. So join the crowds walking the streets of Bushwick and enjoy the overload of art! In case you were getting overwhelmed, let us tell you what is what, and what to expect where!! The converted feather factory at 566 Johnson Ave isn’t new, but they have a new huge gallery! Check out the new awesome space and a solo show of street artist Criminy Johnson (aka QRST) Dreaming Without Sleeping. Art on Fire is a new art space of artist Sheryl Denbo. We are excited to check it out! Is also oh so new. Look at their Group Show No. 1. Camel Art Space is counting its last days at its location on Metropolitan Ave, only to officially open their new space at 1717 Troutman with a new secret name… Go check out First Truth and Yuka Otani in the project space. 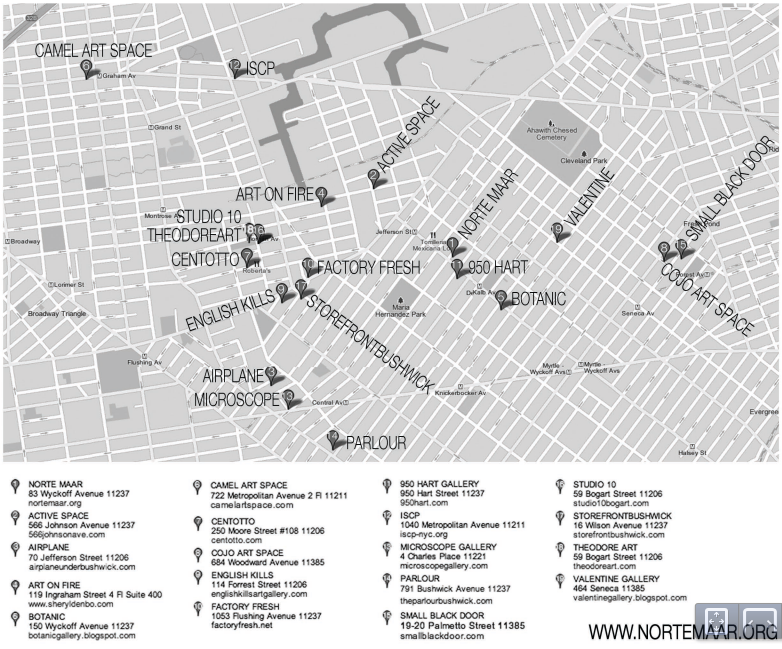 Naturally, head to probably the most well-known apartment gallery in Bushwick! Paul D’Agostino will give you a tour of his current simposio Courtesy Roman Abramovich: The First Unveiling. Now we will all agree that to miss the apartment gallery of Jason Andrew who organizes Beat Nite would be a sin! Norte Maar will feature a solo show of Tamara Gonzales: Untitled, an exhibition of new paintings. In the project room you can check out a new sketchbook by Austin Thomas and recent sculpture by Kevin Curran. Sounds dandy! Off the J train, right behind Little Skips, on the shortest Bushwick street, Charles Pl. is a great gallery of Elle Burchill and Andrea Monti. These guys are all about film and currently are presenting a series of films We Are Cinema, 50 Years of Fimmakers’ Coop. Great show is promised at AIPLANE. Mirror, Mirror is a conceptual group show, which will address the phenomena of anticipation of 2012 Hollywood movie releases, with each artist taking on the film of their choice to generate a piece from. If we say it’s worth it to make it all the way to Ridgewood, we mean it! Go check out Hypercolor, an excellent hyperly colored art show at Small Black Door, a basement gallery of Matthew Mahler and Jonathan Terranova. If you haven’t seen Golem of Ridgewood, the film from 1940s discovered in a house at Seneca, go pay a visit to Fred Valentine on Saturday. Two galleries from the gallery arcade building off Morgan L stop are taking part in Beat Nite. Check out Studio 10 and a newly opened Theodore Art. ISCP is a home to many foreign artists in residency in New York. Get a flavor of what's being made at this cosmopolitan place and pay them a visit on Saturday. Definitely one of the best galleries in Bushwick operates under careful eye of artist Deborah Brown. On Saturday go check out Martin Bromirski, Rachel LaBine, and Elizabeth Riley, and don’t miss the new sign created for Storefront by Skewville. Have you been to Botanic yet? This space on Wycoff Ave had opened a couple of months ago, and its size and type reminds us a little bit of Storefront Bushwick. The Commons, the show the space is opening on Saturday, looks really awesome. Sarah Butler will be marking the glass window of the gallery, and transcribing text from the local graffiti and intertwining it with notional annotations from her personal experience. Another artist in the show Julie Trembley, has transformed the gallery into an artificial green space that is saturated with vibrant grass, bright sun, and an unlikely perch from which viewers are encouraged to take it all in…. Factory Fresh, Bushwick’s street art gallery is always fun to go to. On Saturday, you can check out the birthday show of the twin brothers duo, Skewville. Moreover, Bushwick Daily’s Jojo Soul will be DJing there - and those who know Jojo also know that you will dance like a crazy animal, and potentially have the best time of your life while at it. English Kills should be your last stop, because that’s where the official after party is! Also take a look at the Permanent Collection 2 that is being exhibited, and features some of the coolest artists ever shown at English Kills like Tescia Seufferlein and Don Pablo Pedro.